Somewhere around the middle of 2012, I set out to test an affiliate marketing strategy that I thought had some huge potential. I knew that it was going to be a long-term play and that I wouldn’t see really much financial benefit early on. It was a strategy that required planning, consistant effort, patience, and a little bit of insider knowledge. In the world of stocks, insider trading is illegal. In the world of blogging and affiliate marketing, insider trading is one of the smartest strategies you can employ. As I write this (in a April of 2013), the strategy that I started building off of in mid-2012 has made me a little of $22,000 and continues to bring in consistant income on a monthly basis from promoting one single affiliate product. The above screenshot is from my Clickbank account as of today. You’ll notice that I set the dates from January 1st, 2013 to April 30th, 2013 (4 months). You can see that this is all from promoting one product (webactix) and that the total sales number is $22,397.62. I’m going to attempt to teach this strategy as best as I can. However, keep in mind upfront that it does take consistant effort and it does take a bit of networking and making connections. The latter being the key difficulty for most people. The major key to this strategy is making connections and getting to know people in the affiliate marketing world. The more people you know, the more likely you are to get insider knowledge. With the example above, I had the benefit of getting to know and becoming good friends with Josh Bartlett, creator of Easy Video Player and its followup, Easy Video Suite. Having known Josh for many years, I was able to extract from him what his next product was going to be called. I learned that the Easy Video Player followup would be named Easy Video Suite. Just this little bit of knowledge gave me a HUGE advantage over all the affiliate competition. Having this insight allowed me to register a key domain name and start my SEO efforts ahead of everyone else. I purchased the domain name EasyVideoSuite.net, began building a blog, and was able to get a jump start on SEO before anyone else even knew what the product would be called. The key to this, however, is the ability to get the insider knowledge and the ability to network with people “in the know”. I was lucky enough to be a longtime friend and business partner with Josh so I had a leg-up there. However, getting out there and networking is not difficult at all. It just requires that you put yourself out there a bit, get out of your comfort zone, and get to events where marketers hang out. There’s a marketing event probably twice a month, there’s probably one coming to a town close to you soon. You just need to find them and start making connections. The ability to know about new products and product launches months (or even years) before they are ever released will give you a huge advantage in the marketing game. Being a marketing insider allows you to get a jumpstart on everyone else with your promotional efforts. I’m not sure if I’ve seen anyone else talking about this concept but it’s probably one of the best kept secrets in the affiliate marketing world. Get to know people, get to know what they’re working on, ask to be an affiliate, and grab a domain name that compliments the product name as early as possible before someone else does. Ok… Now that you understand why I call it Affiliate Insider Trading and what the concept is, let’s look at the blog side of things. The next piece of this strategy is the blog. 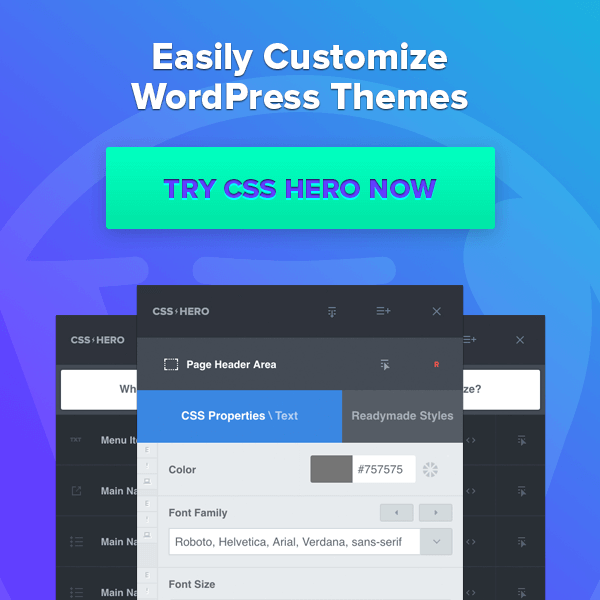 As soon as I have a killer domain name that represents the product well, I install WordPress and a few key plugins to help with on-page search engine optimization. I’m not going to dive in to details now about how to install WordPress or what plugins need to be installed because that’s exactly what I teach in the free 7 day blogging bootcamp. 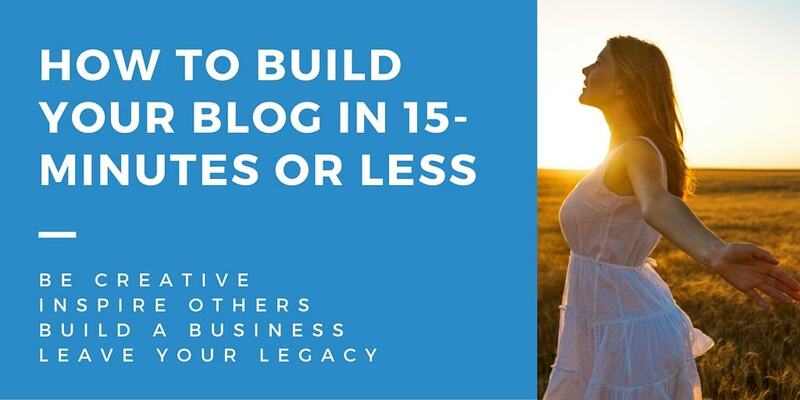 Make sure you go through that course completely to learn the steps of getting a blog online and optimized. Once I’ve got my blog online and optimized, I begin writing blog posts about everything I know about the product. I’ll write a blog post about rumors I’ve heard about the product, I’ll write a post about my personal connection to the product so that people realize I’m a credible source, and I’ll make posts about the stuff that I know for sure is in the works with the product (after getting permission from the product creator). I’ll continue to make posts like this at a rate of one per week or so all the way until the product is launched. This gives me tons of content on my site and it shows visitors that I’m really knowledgeable on the product. It also gives me a lot of pages that can rank for our keyword (the product name) in the search engines. Once the launch date gets closer, I’ll put together two very special posts that are key to this strategy. 1) A review post – I’ll give an in-depth review of the product and explain exactly what I like about it and maybe even a couple things that I think are lacking. I’ll usually make a video for YouTube with my review that I’ll embed in the post as well. 2) A huge bonus – I’ll put together a really awesome bonus for anyone who purchases the product. The bonus will be something relevant and useful for people who purchase the product. It can be something as simple as a free consultation call to something a little more complex like a piece of software I hired someone to develop that compliments the product. Whatever bonus you can add to help entice the buyer to use your affiliate link. I write these two posts for a coupe reasons. One of the main reasons being that, when a new product is released, people tend to search for the product name reviews and product name bonuses. 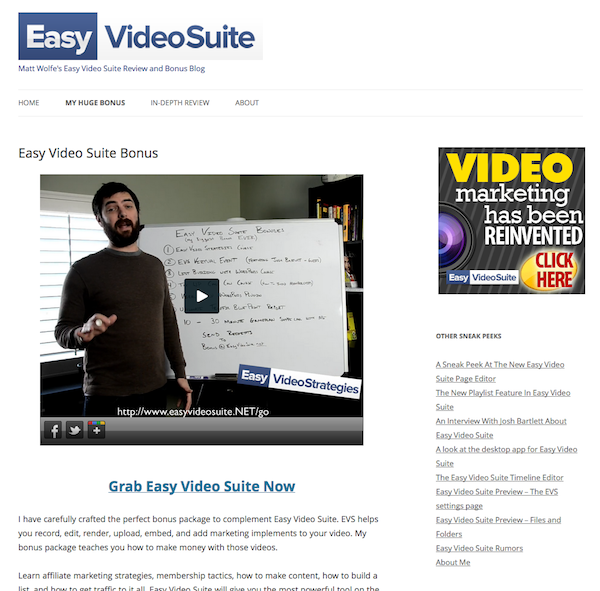 In my example, people would search Easy Video Suite Bonus or Easy Video Suite Review to find out more about the product and to find out if they can get some extra goodies thrown in with it. The other obvious reason is to really entice people to buy once they are on my page. This strategy is purely an SEO strategy. I’m attempting to get as many people searching for this product in the search engines as possible to find my page over any other affiliate’s page. The beauty of this example is that I actually ranked above EasyVideoSuite.com during the launch phase of this product. I’ve since dropped to second place in the search engines but it’s not really a big deal. Most people searching for Easy Video Suite on Google now aren’t searching to find the product anyway… They are searching to find reviews and bonuses. So being second only to the main product itself, is still like being in first position as far as those searchers are concerned. My SEO strategy is actually pretty simple. I have a few sites that I use to send links back to my site that seem to be pretty effective. I use WordPress.com, Tumblr.com, LiveJournal.com, and YouTube.com… That’s it… That’s my whole strategy. I attempt to register the domain names for the product I’m promoting. For example, I would register EasyVideoSuite.WordPress.com, EasyVideoSuite.Tublr.com, and EasyVideoSuite.LiveJournal.com. Once I’ve got all of these free domain names with my keyword in the URL, I would write smaller, stripped-down blog posts about the product itself. 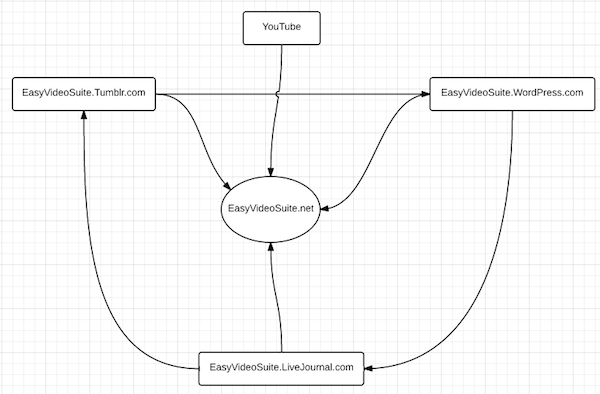 I would then link back to my main site at EasyVideoSuite.net using various keywords as the anchor text. I would drop a link on one of the posts that say Easy Video Suite Review and link to my site. Another page may have just the naked link easyvideosuite.net and link back to my main site… I just mix up the keywords I’d use to link back to my site as well as occasionally link back to an internal blog post instead of the blog’s home page. This works because these sites are already seen as authority sites in the search engines. These sites themselves quickly rank and send even more “link juice” to my other sites. 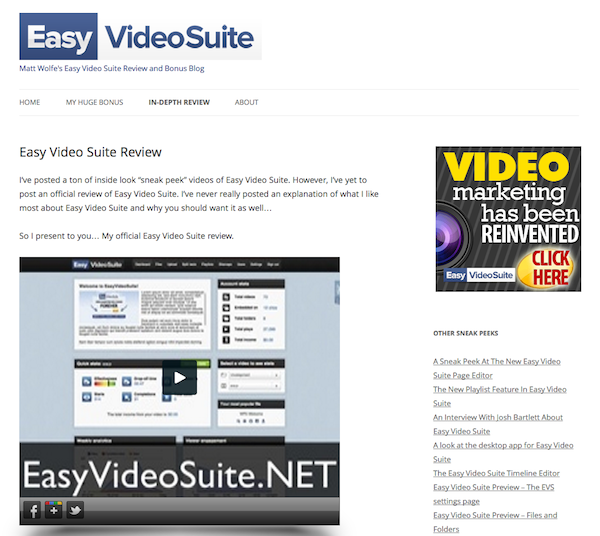 The final step is that I put reviews and insights in to little videos on YouTube and link from those videos back to my main EasyVideoSuite.net site as well. You’ve got link juice passing between all your free blogs on Tumblr, WordPress.com, and LiveJournal. You’ve got all those passing link juice to your main site… And you’ve got YouTube passing people over to your site as well. The YouTube videos are more to capture people who search for things like Easy Video Suite Bonus or Review straight from YouTube and get them paying attention. I’m not sure if much link juice is passed for SEO from YouTube (I could be wrong though. Google is mysterious). I employed the exact strategy that I just laid out above over an 8 month period leading up to the launch of Easy Video Suite. The strategy ended in me making over $20k since the launch in January of this year. The strategy works 100% and I’ve got more domain names that I’ve snatched up to employ the idea again and again (I just can’t give them all away and kill my competitive advantage). I’d love to hear your thoughts and insights on the strategy in the comments below. Bradley and I have many more case studies similar to this one going inside the Premium Members Area. So if you haven’t become a premium member yet, consider checking it out for more in-depth case studies as well as over-the-shoulder video tutorials of this technique as well as others. I hope you enjoyed this little case study and I’m looking forward to chatting with you in the comments! Matt Wolfe was one of the original founders of LearnToBlog.com as well as the author of the Amazon bestseller, WordPress Revealed. Matt also runs a design and consultation service and has taught over 30,000 people how to get their websites online and working for them. Find Matt's personal rants and Tips at MattWolfe.net.